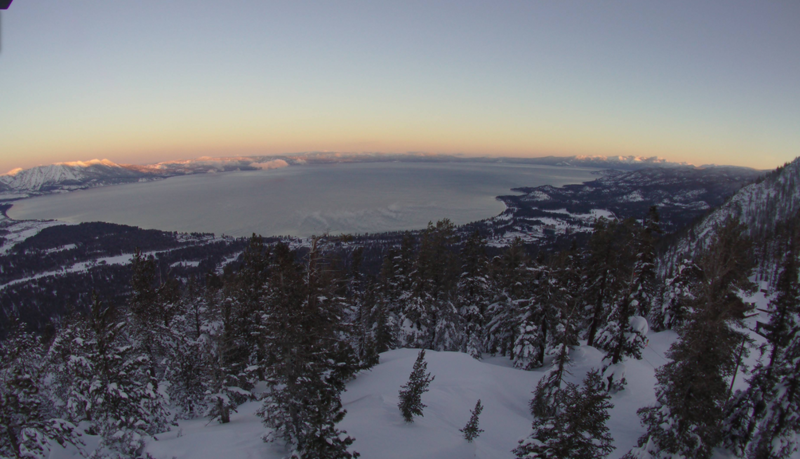 The view from Heavenly Mountain Resort Friday morning. You can put the shovel down — this weekend will bring a break from the intense storms that have dominated February and helped Sierra Nevada ski resorts shatter February snowfall records. Mostly sunny conditions are expected Friday afternoon through Saturday at Lake Tahoe, according to the National Weather Service in Reno. A slight chance of snow showers is possible before 11 a.m. Friday and after 11 p.m. Saturday. Less than half an inch of snow may accumulate at lake level Saturday night. Sunday will bring a slight chance of snow to the lake, with accumulation of less than an inch possible at lake level. Temperatures will gradually climb higher through the weekend with a high temperature of 32 degrees Friday, 37 Saturday and Sunday, and 39 degrees on Monday in South Lake Tahoe. Low temperatures will increase from 16 Friday to 25 Saturday and 30 degrees on Sunday. Monday will bring a chance of snow and rain later in the day. Cloudy conditions and warmer temperatures are in the forecast next week.